As we reflect on the wonderful experience had by all at the 19th Maccabiah Games, we are reminded of the importance and impact the Maccabi Games has on the supporters and athletes. "What do you get when you immerse 12 teenage baseball players, some with no interest in Judaism, into the Orange County JCC Maccabi Games and ArtsFest? An amazing, unique and distinctly Jewish experience with memories and new connections for a lifetime. As a volunteer for the 2013 Maccabi Games after years as a Little League coach, I had a pretty good idea of what to expect from the baseball side of the equation. On the other hand, my summers as a madrich (counselor) at Camp Young Judaea were long ago, and with very different kinds of kids. With some teens clearly going to the games just for the sports, I was doubtful about how the Jewish part would play out. This, however, is the very approach and strength of the Maccabi movement, which produced the first JCC Maccabi Games in Memphis, Tenn., in 1982. By drawing in teens through their love of athletics and interest in meeting other kids, Maccabi is well positioned to infuse Jewish principles and a sense of identity to all participants. And in Orange County, the opportunity was presented on a staggering, exciting scale. It began outside a 9,000-seat college stadium before the opening ceremonies as more than 2,300 athletes and 450 coaches plus staff began to congregate. The kaleidoscope of color and sound, as some 70 delegations with distinctive uniforms milled about, amazed both kids and coaches. “I’ve never seen so many Jews in one place,” mused our catcher, Jack." Soon, athletes and artists began mingling in an early exchange of teenage overtures. As I watched a group of girls from Great Britain saunter over to take pictures with our delighted East Bay players, I began to get how this all works. And while it was exciting to walk into a stadium filled with thousands of fans and family members, it was even more fulfilling to watch my son and his teammates riveted by a video tribute to the Munich Olympic victims — a story that instantly connected all of them to a Jewish past and identity. For the players on our 14-and-under baseball squad, the week was certainly about the competition: seven games in four days, on beautiful fields, in dugouts with cubbies and lockers and in one case, a view of the ocean. 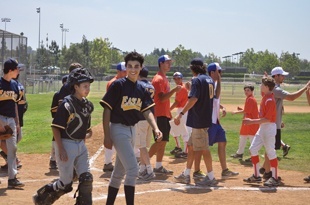 The JCC East Bay baseball team walks off the diamond after playing Orange County at the 2013 Maccabi Games in Irvine. As a coach, I experienced an entertaining if familiar blend of sport and Jewish traditions: food (all kosher) everywhere, including hot lunches served by little old ladies who urged players and coaches to eat (“really, there’s plenty here”); closing ceremonies preceded by a flurry of jersey, hat and shirt trading; the frequent games of Jewish geography. More significant, however, was the coming together of a wildly diverse Jewish community, including 850 host families and 2,000 local volunteers, all committed to helping unite and build interest in being Jewish, regardless of background. In a divided Jewish world struggling with assimilation and nonaffiliation, volunteering in a program like this is perhaps one of the most important contributions I can make. JCCs from the East Bay, Peninsula, San Francisco and Los Gatos all fielded delegations, and I know they would welcome your support. I urge everyone who can to get involved — contact your nearest JCC for more information.